Software-Defined Wide Area Networking (SD-WAN) is a new innovative way to provide optimal application performance by redefining branch office networking. Unlike traditional expensive private WAN connection technologies such as MPLS, etc., SD-WAN delivers increased network performance and cost reduction. SD-WAN solution decouple network software services from the underlying hardware via software abstraction. 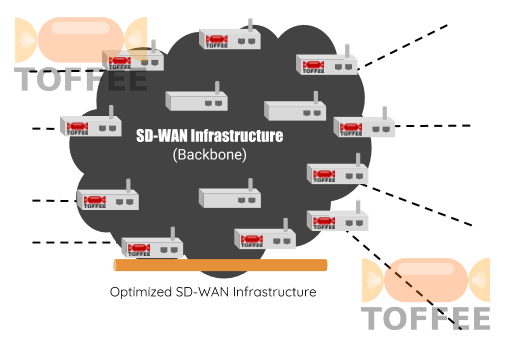 If you are a SD-WAN provider you may have an efficient SDN-Cloud based SD-WAN infrastructure, but the real challenge is the connectivity between your clients (SD-WAN subscribers/users Branch Office Edge Devices/CPE) and your Cloud Infrastructure. 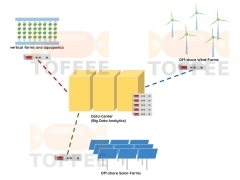 This last mile connectivity bottleneck can be addressed via TOFFEE-DataCenter as shown below. NOTE: In this case let us assume you (the SD-WAN service provider) have a client/subscriber who got high-speed network connectivity between their corporate headquarters(may be situated in a data-center, etc) and your SD-WAN Cloud Infrastructure. But they have various other remote branch-offices with extremely poor high-latency Internet/network connectivity. 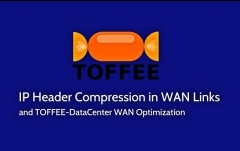 Along with VPN modules/components you can even use TOFFEE-DataCenter as one of the building blocks within your SD-WAN Infrastructure.